Tags: Architectural Visualisation, 3D Rendering, CGI Animation, 3D Floor Plans. How do you visualise, increase the value and sales interest in your next architectural design project? Using the latest 3D design technology, it is possible to present different material & build options to your clients, in less time. Choose print quality still images or a fully animated CGI presentation with interior floor plan. 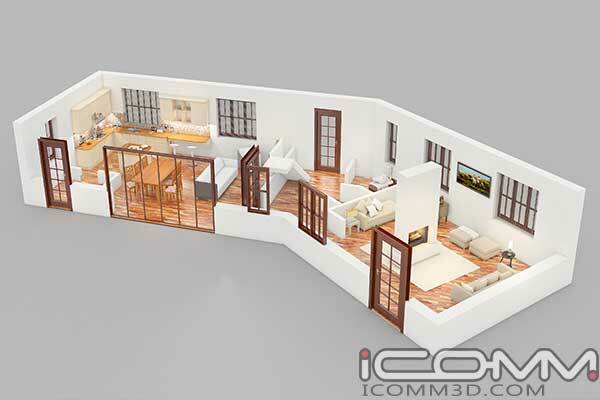 ICOMM 3D have the ability to transform your existing 2D CAD or Hand Drawn plans into an inspiring 3D rendered presentation, with a degree of detail and realism to suit your budget and time frame requirements.